"Takasago-an Bonsai Garden" in Niihama in Ehime prefecture is known as Japan's most famous bonsai garden. 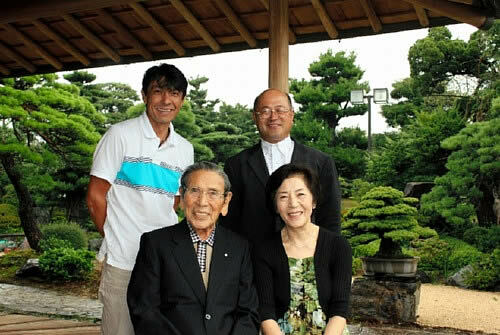 Mr. Daizo Iwasaki is the owner of this garden and the Honorary Chairman of World Bonsai Friendship Federation. He also gives support to ASPAC Takamatsu. His wife, Naemi, is the Vice Chairwoman of the Federation and they contribute the friendship among bonsai fanciers. Mr. Iwasaki kindly accepted an offer to exhibit his bonsai masterpiece in the "Green Fest Kokubunji" which will be held in Kokubunji in Takamatsu in Kagawa from October 22 to 24. 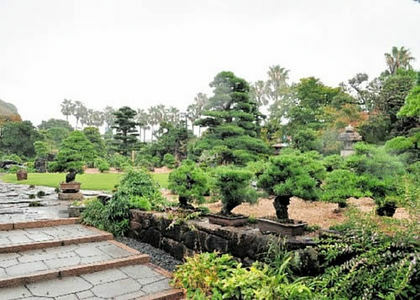 The grounds of the garden are about 66square kilometer and contain about 200,000 rare specimens of Bonsai. In area of bonsai masterpieces, there are some Japanese masterpieces which were awarded Kokufu Prize such as "Tendan" and "Musashi" of Zuisho, and "Seidai" of Japanese black pine. All bonsai artists in Japan respect Mr. and Mrs. Iwasaki and visit Takasago-an Bonsai Garden at every opportunity. This time Hiroyoshi Yamaji, Chairman of JA Kokubunji Bonsai section, and Koji Hiramatsu, Vice-Chairman of the section, visited Takasago-an and meet Mr. and Mrs. Iwasaki to express their appreciation for accepting the offer to exhibit a masterpiece in Green Festa which will be held as pre-event of ASPAC in 2011. Mr. Iwasaki serves as the Honorary Chairman of ASPAC Takamatsu. He is well known to the bonsai people in all over the world, so he is a strong partner for the committee. In ASPAC Takamatsu, Takasago-an will be open to visitors so some people will participate to visit here. Mr. Iwasaki said, "ASPAC is a great opportunity to bonsai people in Takamatsu. This is the first time to be the host of this international event, but I hope they will try their best." In addition, about exhibiting his masterpiece in Green Festa Kokubunji, "I'll be glad if I can make many people happy by my bonsai which I loved. I wish their success in the event," Mr. Iwasaki said with a smile. 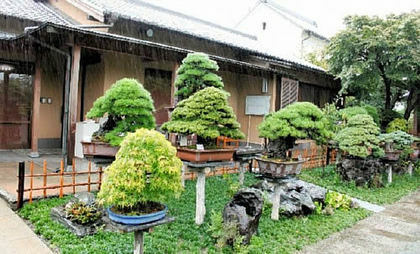 I stay in Kyoto in november for the "TAIKAN TEN" and I hope visit the bonsai garden of Mr Daizo Iwazaki. did you think it's possible ? I'd like to buy the Daizo Iwasaki's book Takasago-an garden collection. Any information? Thanks!